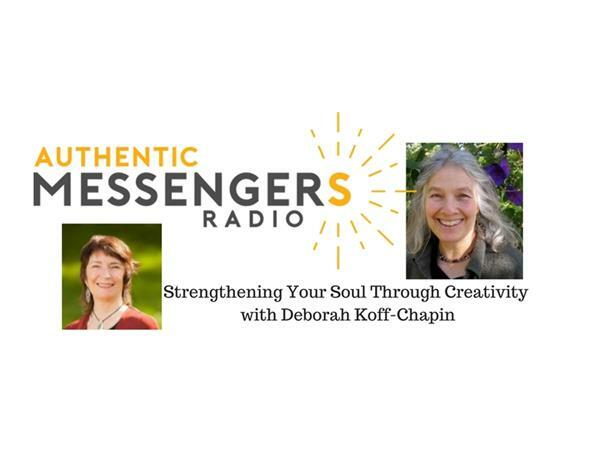 A conversation with Deborah Koff-Chapin, originator of Touch Drawing and creator of SoulCards about the value of creative expression in these times. Deborah will talk about what she has gleaned through her 43 years of Touch Drawing, about the power of spontaneous expression arising from inward attention. She wil discuss how this can support integration with deeper aspects of the soul. Deborah Koff-Chapin has been developing Touch Drawing since it came to her as an inspiration in 1974. She teaches the process at conferences and graduate programs internationally. Deborah is creator of SoulCards 1&2 and five SoulTouch Coloring Journals. She is author of Drawing Out Your Soul and The Touch Drawing Facilitator Workbook. Deborah has been Interpretive Artist at numerous conferences including The Parliament of the World’s Religions. She holds a BFA from Cooper Union and is an ordained minister of Incarnational Spirituality. Deborah has served on the board of the International Expressive Art Therapy Association and is founding director of the Center for Touch Drawing. A gift for listeners: A free digital sample of Creative Awakening - SoulTouch Coloring Journal. These coloring journals bring a new level of depth and artistic expression to the coloring craze. The flowing forms of Deborah’s evocative images encourage a creative, free form approach to coloring.